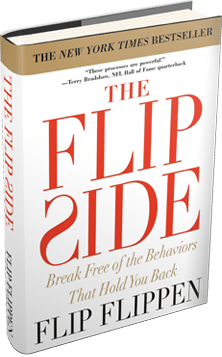 Hi, I’m Dr. Chris White, best-selling co-author of The Flip Side and a PhD Statistician. Here are 5 Things That Should Never Go Together and 2 Surprising Things That Should. The first 2 things that should NEVER go together are…Donuts and Seafood. This is not photoshop–I took this picture myself in a small town in Texas. I didn’t go in, but I can picture them asking “Sir, would you like to try the salmon glazed chocolate donut?” Uggghh. I at least hope they switch out the cooking oil! The next 2 things that shouldn’t go together are Diet Coke & Snickers. Come on, are we cutting calories or what? Oh, wait, I think the Diet Coke cancels out the Snickers calories–never mind, these DO go together. With the next 2, you have to figure out the second part of the duo. Bacon and ______ should never go together. Got an idea? Wrong, it’s a trick question, bacon goes with everything. Next we have Chicken & Waffles. First I see they make potato chips. No thanks. And then I’m at one of my favorite pizza places and the pizza of the month is Chicken and Waffles! I told them what I was doing and then even gave me the sign as proof. Lastly we have…Celery & Jello! That is just nasty. My grandmother loved me so much but it didn’t show up in her jello making because she put celery in her fruit jello. I guess jello making wasn’t her love language! I think I can still taste that crunchy celery! But our main topic for today is 2 Things That DO Go Together that a lot of people don’t think about. And I’m referring to behaviors here. Drumroll please, our 2 things that DO go together are…Nurturing & Criticality! Oh, really? Let’s start with Criticality–what am I referring to? Think about yourself as I define the behavior because I’m about to have you rate yourself on a 1 to 10 scale. Criticality is basically a reflex to critique. Some people have a very very strong reflex, and you see it in their body language, their expectations of others, their tendencies to point out concerns, and their candor. So write down a number from 1 to 10 that measures your Criticality. An 8 or 9 would have a very high reflex, someone who is typically harder to please and who really scrutinizes what people say. A 5 would be somewhat of a reflex but not as pronounced. A 2 or 3 would just be a more positive person–someone who is more tolerant and who gives people benefit of the doubt. Now let’s take our understanding just a bit deeper. Maybe the better question isn’t “Am I Critical?” but “When am I Critical?” I’m going to give you 5 scenarios you tell me in which ones does your Criticality surface the most. Three is with your inner circle. Even some of you that are less critical overall can have a much shorter fuse with your inner circle! So you may need to tone it down, let’s say, at home, but at work tone it up. Four is when you are under stress. Well, that assumes you know what stress feels like. You probably don’t have any. Well then hypothetically, if your job or home life could ever be stressful, think about if that elevates your criticality. For me, we recently built a new house and got a puppy. Uh-oh. Five is when people share ideas or opinions with you. Some of you can’t help but see the flaw in their argument or in the idea they are so excited about. You are the one that rolls your eyes when people forward that email or make that post on Facebook. So now look at the 5 scenarios again and pick one that you need to either tone it down or tone it up. Our second behavior in our combo is Nurturing. Get ready for your 1 to 10 rating as I define Nurturing. It’s basically the reflex to Nurture, which would include giving compliments, expressing appreciation, taking conversations deepers, keeping in touch with people, being empathetic, and being a great listener. Gulp. I’m good at a couple of those but not great at some others. This is actually fairly common. Nurturing is a very multidimensional trait–one way I often describe it is that Nurturing is a big house with many rooms. You may be great at a few rooms but there are likely some others that could use improvement. Or maybe you are too nurturing and your house is it tip-top condition and you keep dusting the cabinets. I might have you go back and work on better leveraging your nurturing by increasing your Criticality. You’ve earned the right, you’ve built the capacity, so don’t just leave it there. You may not want to go tell someone off after watching this but you could probably be more intentional in addressing issues and be extra careful of sugarcoating too much. And by the way if your Criticality score was 7 or higher, so ahead and subtract 2 more from your Nurturing score. Hopefully you didn’t go into the negatives now! But that’s a great reminder that if you are more critical, it really can nullify and erase some of your Nurturing. Let’s talk about 2 common combinations. First we have High Criticality and Low Nurturing. One one hand, they demand excellence and are good at making things better. On the other hand, they can wear people out and cause people to have to spend time just recovering. There’s also Low Criticality and High Nurturing. These people are just sweeties who never want to hurt someone. People often ask me if it’s better to be high on Nurturing or on Criticality and I tell them…Yes! Ideally a leader is high on both. They earn the right, they deepen the connection, they communicate with genuine concern, but they also say what needs to be said and they challenge people to be better. But most people lean one way or the other. So think about yourself–which of the two could you improve on the most? Or maybe which situation within one of them could you improve on. Most people just go through life and don’t think about these intricacies. And they really should, because these 2 behaviors in particular play a huge role if not the primary role in determining something that I suspect is fairly important to you…your Legacy! I don’t need you to reinvent yourself. I just want you–and me–to stretch ourselves and be able to be high on both Nurturing and Criticality.